Due to my experiences ministering in cross-cultural environments, I'm often asked about resources that can aid others in their own understanding of cultures different than their own. Several years ago, I provided a list of books that I've found particularly helpful in my own journey of learning about the experiences and background of different ethnic groups within the United States. In a similar vein, I'd like to provide a list here of 26 films that I've personally watched or have had recommended to me that can assist us in entering into the stories of those from a variety of ethnic and cultural experiences. These are not necessarily "Christian" movies so they may contain elements that some will find objectionable so I encourage you to check the "Parents Guide" on IMDB.com for each of these films before watching them. One of the challenges of compiling a list like this is that one is bound to leave out a number of worthwhile selections. So instead of seeking to be exhaustive here, I've limited the number of movies. As well, I've attempted to avoid recommending films that are told from the vantage point of someone from majority culture or where the story of ethnic minorities is minimized and the "white savior" takes center stage. I've listed movies to grow in your understanding of African Americans, Asian Americans, Latinos and Native Americans. In addition, I'm recommending several films I've seen that address the realities of marginalized groups in other parts of the world, as well as dealing with race in general. The Color Purple (1985) - A black Southern woman struggles to find her identity after suffering years of abuse from her father and others over 40 years. Fruitvale Station (2013) - The story of Oscar Grant III, a 22-year-old Bay Area resident killed by police, who crosses paths with friends, enemies, family, and strangers on the last day of 2008. Hoop Dreams (1994) - A documentary following the lives of two inner-city Chicago teenagers who struggle to become college basketball players on the road to going professional. Malcolm X (1992) - Biographical epic of the controversial and influential Black Nationalist leader, from his early life and career as a small-time gangster, to his ministry as a member of the Nation of Islam. Selma (2014) - A chronicle of Martin Luther King's campaign to secure equal voting rights via an epic march from Selma to Montgomery, Alabama in 1965. Bend it Like Beckham (2002) - The daughter of orthodox Sikh rebels against her parents' traditionalism and joins a soccer team. Better Luck Tomorrow (2002) - A group of over-achieving Asian-American high school seniors enjoy a power trip when they dip into extra-curricular criminal activities. Gran Torino (2008) - Disgruntled Korean War veteran Walt Kowalski sets out to reform his neighbor, a Hmong teenager who tried to steal Kowalski's prized possession: a 1972 Gran Torino. The Joy Luck Club (1993) - The life histories of four Asian women and their daughters reflect and guide each other. The Namesake (2006) - American-born Gogol, the son of Indian immigrants, wants to fit in among his fellow New Yorkers, despite his family's unwillingness to let go of their traditional ways. Cesar Chavez (2014) - A biography of the civil-rights activist and labor organizer Cesar Chavez. The Lost City (2005) - In Havana, Cuba in the late 1950s, a wealthy family is caught in the violent transition from the oppressive regime of Batista to the government of Fidel Castro. My Family (1995) - This epic film traces over three generations of a Mexican American immigrant family's trials, tribulations, tragedies and triumphs. Selena (1997) - The true story of Selena Quintanilla-Perez, a Texas-born Tejano singer who rose from cult status to performing at the Astrodome, as well as having chart topping albums on the Latin music charts. Stand and Deliver (1988) - The story of Jaime Escalante, a high school teacher who successfully inspired his dropout prone students to learn calculus. Bury My Heart at Wounded Knee (2007) - A chronicle of how American Indians were displaced as the U.S. expanded west. Based on the book by Dee Brown. On the Ice (2011) - In Barrow, Alaska, teenagers Qalli and Aivaaq find their bond tested when a seal-hunting trip goes wrong, resulting in the death of their friend. Powwow Highway (1989) - A member of the Northern Cheyenne tribe of Lame Deer battles greedy developers as he tries to persuade the council to vote against a strip-mining contract. Reel Injun (2009) - A documentary film that traces the history of the depiction of Native Americans in Hollywood films. Smoke Signals (1998) - Two friends from the Coeur D'Alene Indian Reservation go on a road trip to retrieve the remains of a recently deceased family member. Crash (2004) - Los Angeles citizens with vastly separate lives collide in interweaving stories of race, loss and redemption. 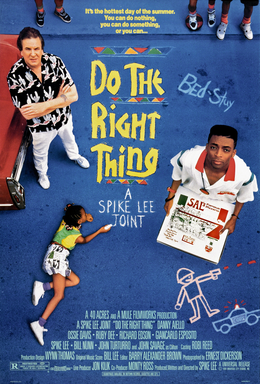 Do the Right Thing (1989) - On the hottest day of the year on a street in the Bedford-Stuyvesant section of Brooklyn, everyone's hate and bigotry smolders and builds until it explodes into violence. Invictus (2009) - Nelson Mandela, in his first term as the South African President, initiates a unique venture to unite the apartheid-torn land: enlist the national rugby team on a mission to win the 1995 Rugby World Cup. The Kite Runner (2007) - After spending years in California, Amir returns to his homeland in Afghanistan to help his old friend Hassan, whose son is in trouble. Rabbit-Proof Fence (2002) - In 1931, three aboriginal girls in Australia escape after being plucked from their homes to be trained as domestic staff and set off on a trek across the Outback. Schindler’s List (1993) - In Poland during World War II, Oskar Schindler gradually becomes concerned for his Jewish workforce after witnessing their persecution by the Nazis. I hope that you'll take the time to view a few of these movies as we grow in understanding, empathy and compassion towards one another. As always, personal friendships are the best way to learn about other cultures but watching films like those listed here can help us in the process.